The Great British summer isn’t always that great… Some days the wind howls and the rain pours and the last thing you feel like eating is summer food. Today was one of those days. I wanted a summer vibe but the day certainly called for a warming stew. So I pulled out the slow cooker and in went some leftover vegetables, some beans and some sweet smoked paprika and a few hours later out came a rich warming smoky BBQ beany stew. By the time the stew was ready the sun was shining so the stew was wrapped in tortillas with cheese and sour cream and eaten with a salad! A BBQ flavoured stew for those summer days when the sun doesn't shine. Heat the slow cooker to low - my slow cooker has a pan you can use on the hob to get things started so there is no transferring food from a pan to the slow cooker. Lightly grease the slow cooker with sunflower oil. Add the onions, garlic, pepper and carrots and gently fry for a few minutes. Tip in tinned tomatoes, cherry tomatoes, beans, potatoes, Worcestershire sauce, smoked paprika and season to taste. Transfer to the slow cooker and cook on low for around 8 hours. If you’re eating the stew in tortillas you may want to thicken it a little with cornflour first. BBQ Beany stew is fab served with plain boiled rice, mashed potatoes or our picnic bread if the day stays cold, wet and windy. If the sun starts to shine then stuff it into tortillas sprinkle with cheese and sour cream and eat with a salad. 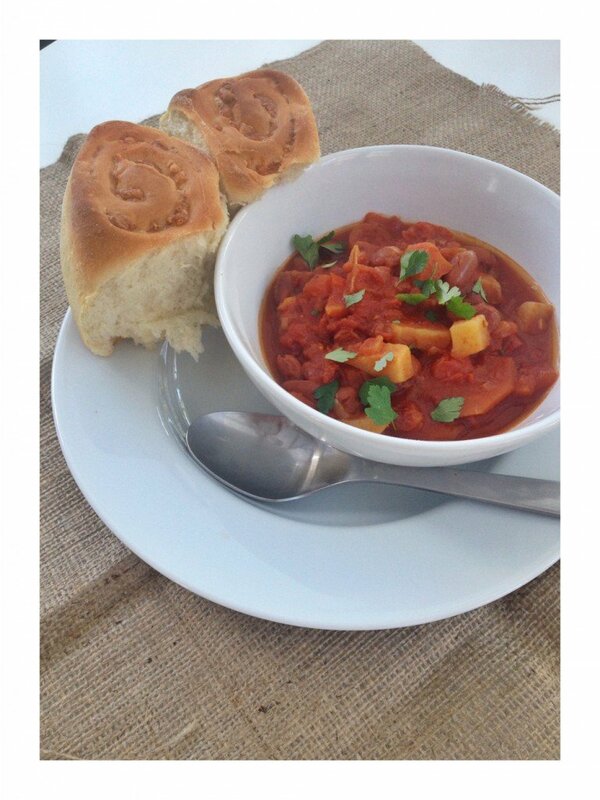 Our Summer BBQ Beany stew was featured in The Express. This would be a great camping recipe – cooked up in a Netherton Foundry outdoor slow cooker!